Cantons want to cut corporate tax. A look at the "Tax Reform and AHV Financing (TRAF)." The Swiss electorate will decide on the Tax Reform and AHV Financing (TRAF) on May 19, 2019. If the reform is accepted, the cantons plan to cut corporate tax. The cantons differ significantly in this regard. With the proposal, the Confederation aims to deliver a competitive tax system that complies with international regulations. It is meant to uphold Switzerland's attractiveness as a business location. With the current tax system, holding and trust companies located in Switzerland who generate their sales revenue and costs abroad benefit from reduced tax rates or even tax exemption. This is set to change with the new proposal. The Tax Reform and AHV Financing (TRAF) aims to abolish the privileged taxation of such special-status companies. A balance is to be reached between the special-status companies and the local SMEs. Study on the "Tax Reform and AHV Financing (STAF)"
Cantons competing for companies: Which strategies might the cantons introduce following Swiss tax reform? Specifically, this means that special-status companies will pay higher taxes after the proposal is implemented. Regularly taxed companies, on the other hand, would pay lower taxes. However, it is worth remembering that the special-status companies are of central importance for Switzerland. With a contribution of around 3.6 billion per year, special-status companies currently account for around half the Confederation's corporate income tax receipts. At cantonal and municipal level, their share of tax receipts is also high. Special-status companies also shape the research and development sector, as they account for almost half of private company spending. If the Tax Reform and AHV Financing is accepted, all legal entities, whether special-status companies or SMEs, will be subject to the same tax regulations in future. However, new privileges at cantonal level promise some room for maneuver: They allow for innovative activities to be promoted in Switzerland, and aim to uphold Switzerland's attractiveness as a business location. For example, the cantons offer the companies tax relief options through obligatory patent boxes. Profits from patents must therefore be taxed at a privileged rate. Optional deductions for expenses in the area of research and development are possible. On the other hand, the reform limits the options for reducing the tax assessment basis. That is why numerous cantons plan to reduce corporate tax to counteract this. The extent of this reduction varies significantly from canton to canton. The cantonal adjustments to corporate taxes would significantly shift the ranking of the cantons according to locational quality. This is because the reduction of corporate taxes could make individual cantons more attractive as a location. 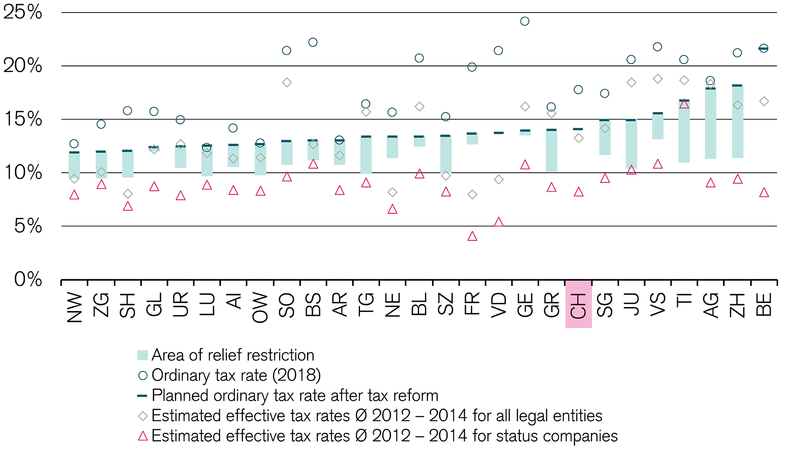 Cantons that currently have high rates of corporate income tax and many special-status companies are under particular pressure. Without a significant reduction in the ordinary rate of corporate income tax, there is a risk that these companies will leave. The rankings are likely to change in the coming years. We provide a look at the locational quality indicator for 2025. If the proposal for "Tax Reform and AHV Financing" is rejected by the electorate, the cantons will have significantly less scope to reduce corporate taxes. Switzerland also risks losing its appeal as a location for international companies, given the current planning uncertainty. From an economic perspective, a clear "No" would have far-reaching consequences for Switzerland. Due to the privileged taxation of special-status companies, Switzerland is already under observation by the EU and the Organization for Economic Cooperation and Development (OECD). If the proposal is rejected, Switzerland runs the risk of being added to the blacklist or now gray list of Ecofin (Economic and Financial Affairs Council) of the organization. On the other hand, if the tax reform is accepted, initial measures can start being implemented immediately after the popular ballot. The main measures would be likely to be implemented in January 2020, and all other requirements by 2025. Would you like to know more about the Tax Reform and AHV Financing (TRAF)? Is active Cantons want to cut corporate taxes. A look at the "Tax Reform and AHV (Old-Age and Survivors Insurance) Financing (TRAF)"